This weekend, I finally crossed a major to-do off of my list: get red lipstick. It's been in my iPhone Reminders app for months, along with responsible things like "contribute to your IRA" and "take calcium." I wanted oh-so badly for MAC's famous Ruby Woo to be my color, but the man behind the counter told me it's "not for everyone." Oh, and that it's Rihanna's go-to hue. So, you're saying that I'm not Rihanna? Understood. Next stop? NARS, to try on Dragon Girl, which was called a "good 'gateway' red lip" on my favorite beauty blog. It turned out to be just the shade my fair skin and I were looking for: bold and bright but still flattering (at least according to the lovely woman at Sephora). Unlike a traditional lipstick, this color comes in a jumbo-sized crayon that's super easy to apply (ideal for a red-lip rookie like me) and doesn't require a matching pencil or primer or fancy application brush. Sold. To-do list conquered. I wanted to wear my red immediately, and luckily, my husband and I were going to a blues club, which gave me the perfect excuse to dress a little more rock 'n' roll than usual (hello, cropped moto jacket and zippered booties). I stuck to a black-and-white palette, with one more pop of red courtesy of this bag that I'm borrowing/stealing from my mom, who is obviously super cool (thanks, mom!). Trouve leather jacket. Michael Stars shirt. Rag and Bone denim leggings. Sam Edelman booties (now on sale). 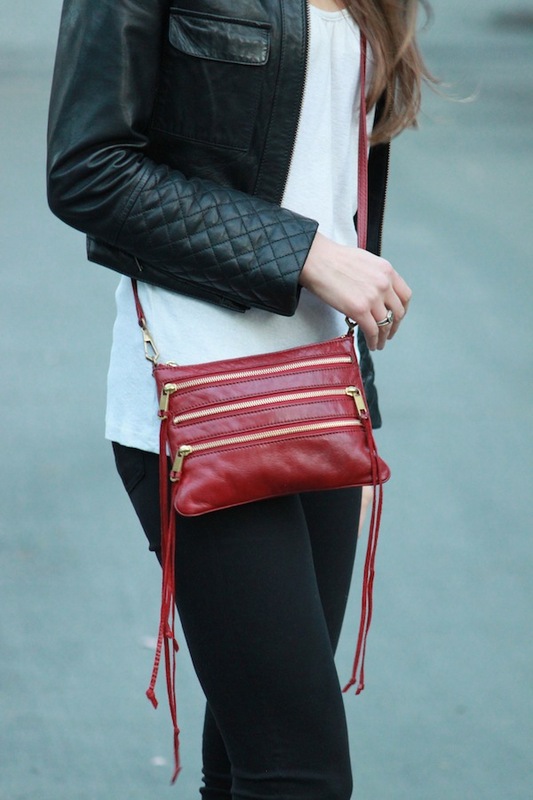 Rebecca Minkoff bag. Thanks so much, Kat! I'm loving how you styled the Lily Aldridge for Velvet dress on your blog today! xo! The red lip colour looks great on you! Thank you so much, Maria! xo! I am such a sucker for a good red lip. The NARS color looks amazing on you too! Thanks so much, Cara! Can't wait to see some red-lip looks on Cara's Cliche, too! xo! Elena! I want to know what color Nars you use (not that we have the same coloring or anything ;) ). Thanks for the tip about Sephora's lip stains! Now I'm tempted to try them, but I should probably stay far, far away...I'm terrible at stain removal! xo!